The Christian IV Hotel Copenhagen is located within a quiet part of town and is only a short stroll from the most popular attractions in the city. Rosenborg Castle is only 300 meters from the hotel. A variety of dining establishments is located within the nearby vicinity of the hotel. There are also many entertainment venues and shopping opportunities situated not far away. 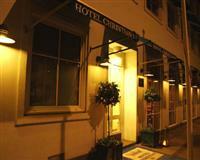 Parking is available at the Christian IV Hotel Copenhagen for the use of guests who arrive by car. The airport is situated within a short drive of the hotel. Public transportation services, including metro services and water taxis, make it easy to access the hotel and get around the city. Bicycle rental services are offered through the hotel. Car rental services are also available. There are 42 well equipped guestrooms at the Christian IV Hotel Copenhagen, each featuring private baths, satellite TV, telephones and wireless Internet connections. The Christian IV Hotel Copenhagen offers a variety of amenities for the enjoyment of guests, including a complimentary breakfast buffet, complimentary newspapers and a reception area.